The Martin MB-1 was a 1910s American large biplane bomber designed and built by the Glenn L. Martin Company for the United States Army Air Service. It was the first purpose-built bomber produced by the United States. In 1921 Martin produced its KG.1 variant of the MB-1, with 10 purchased by the Navy as a torpedo bomber under the designation MBT. After two were purchased, the designation was changed to Martin MT. In response to a requirement from the Air Service for a bomber that was superior to the Handley Page O/400. Martin proposed the MB-1 and were rewarded with an initial production contract for six aircraft. 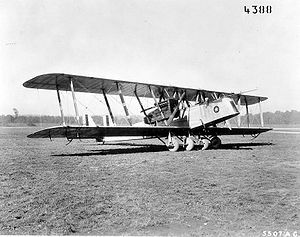 The MB-1 was a conventional biplane design with twin fins and rudders mounted above the tailplane and a fixed tailwheel landing gear with four-wheel main gear. Powered by two 400 hp (298 kW) Liberty 12A engines. It had room for a crew of three in open cockpits. Initial delivery to the Air Service was in October 1918, with the aircraft designated GMB for Glenn Martin Bomber. The first four produced were configured as observation aircraft, and the next two as bombers. Four others were produced before the end of World War I cancelled all remaining war contracts. The last three aircraft each were configured experimentally, with separate designations: GMT (Glenn Martin Transcontinental), a long range version with a 1,500 mi (2,400 km) range; GMC (Glen Martin Cannon) with a nose-mounted 37 mm (1.46 in) cannon; and GMP (Glenn Martin Passenger) as an enclosed 10-passenger transport. The GMP was later re-designated T-1. Six surviving aircraft were later modified and used by the United States Postal Service as mail carriers. The design was the basis the Martin MB-2, which had a greater load capability but was slower and less maneuverable. Ten aircraft were used by the United States Navy from 1922 under the designations MBT and MT and were used as torpedo bombers, two by the Navy and eight by Marine Corps squadron VF-2M. Company and original military designation. Glenn Martin Bomber - Air Service designation for the MB-1 aircraft. Glenn Martin Transcontinental - designation for one aircraft with long range fuel tanks. Glenn Martin Cannon - designation for one cannon equipped aircraft. Martin Bomber-Torpedo - United States Navy/Marine Corps torpedo-bomber variant, two built. The Illustrated Encyclopedia of Aircraft (Part Work 1982-1985). London: Orbis Publishing, 1985, p. 2419. Swanborough, F.G and Peter M. Bowers. United States Military Aircraft since 1909. London: Putnam, 1963. Taylor, Michael J. H. Jane's Encyclopedia of Aviation. London: Studio Editions, 1989. ISBN 0-51710-316-8. Martin MB-1 Pictures and Martin MB-1 for Sale.